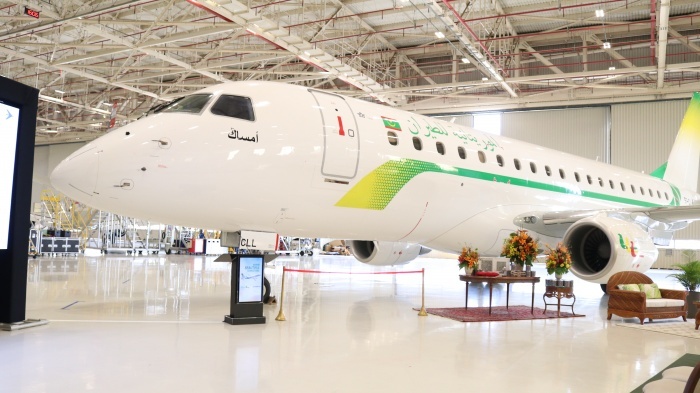 In a ceremony held at the company’s headquarters, in São José dos Campos, Embraer has delivered the first E175 to Mauritania Airlines. The airline signed a firm order with Embraer for two E175 jets in 2018. The contract has a value of US$93.8 million. “We celebrate with Mauritania Airlines the delivery of the first E175 aircraft to Africa. “We are sure that the E175 will achieve in Africa the same success reached in other markets around the world, being recognized as the best aircraft in the 76-seats segment,” said Raul Villaron, vice president, sales, for Middle East & Africa, Embraer Commercial Aviation. The E175 for Mauritania Airlines is configured with 76 seats in a comfortable dual class layout. “The introduction of the E175 in our fleet will allow us to add more frequencies and new destinations whilst enhancing the quality of passenger experience, and offering greater comfort with the best cabin in this category,” said Mohamed Radhy Bennahi, chief executive of Mauritania Airlines. Embraer is the world’s leading manufacturer of commercial jets up to 150 seats.